Holo is a wolf harvest deity originally from a land in the north known as Yoitsu. She made a promise with men from a town called Pasloe where she would ensure the town would have good wheat harvests year after year. However, as time went on, the townspeople slowly started to forsake Holo and did not rely on her as they once did. As such, Holo escapes from town in Lawrence's wagon and started traveling with him to see how much the world has changed since she has been in Pasloe. 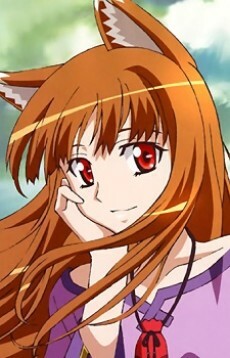 Holo has chosen the form of a girl younger than Lawrence, though she still retains her large white-tipped wolf tail, and ears. Her true form is that of a very large wolf which many people revered and feared. She refers to herself as the "Wise Wolf of Yoitsu" (ヨイツの賢狼). She is typically very haughty and self-sufficient, though due to her isolation for hundreds of years in Pasloe, she gradually feels very lonely, and sometimes shows a more fragile side of herself. She relies on Lawrence for company as she fears loneliness, which is something that Lawrence is very aware of and tries to comfort her in his own way. Holo is also very aware of the different time spans that she and Lawrence have, as a human lifespan is like a blink of an eye for her kind. Holo is quite scared of that fact, but hides it with jokes. She has a peculiar way of speaking, modeled after that of the oiran high-class courtesans. She is fond of delicious food and alcohol, but especially loves apples. She takes pride in her tail and takes special care of it, constantly combing and maintaining it.